Did you see Nurturestore's cement garden tile? I did, and then I got totally excited to work with cement.... and I am not alone, Rebekah from The Golden Gleam was also inspired by the same post. You can read all about her cement adventures today too! Unfortunately, instead of heeding Cathy's wise advice and making a large cement tile I decided to make some teeny weeny cement blocks. My kids love to build dams, walls, fairy houses and various things in the garden. Little cement blocks would have been so useful. In my head I imagined gorgeous little brightly coloured and perfectly shaped cement blocks that would stack neatly. In reality I got ugly grey lumpy blocks. 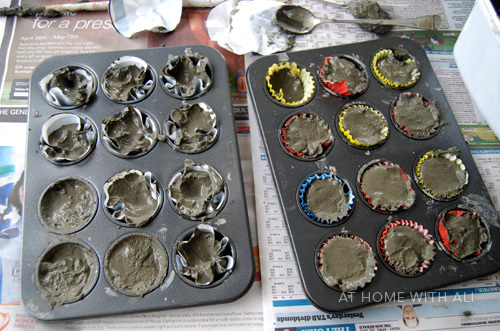 I decided to use my mini muffin pans as a mould. I thought I was being clever by lining the pans so that they could be used for baking mini muffins after this project...... hahahaha in my dreams. I decided to line one of the pans with circular pieces of plastic cut from an old shopping bag. 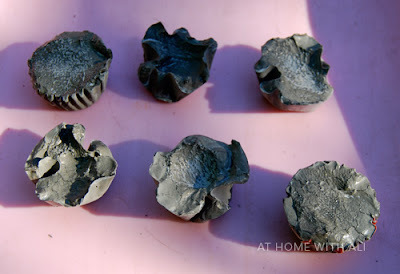 I chucked a mini tantrum trying to get those liners to stay in the teflon coated mini muffin pan while I spooned in cement. Oh yeah, cement does not behave like mini muffin mixture! I decided to line the other pan with paper patty cases – a bit easier but paper patty cases do not easily come off hardened concrete. 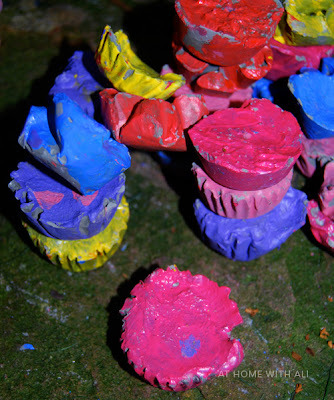 To salvage something from this cement disaster, Cakey and I painted our blocks in bright, glossy paint. The gloss was gone after a week and the paint has faded and flaked leaving us with a set of ugly grey cement lumps. Super! 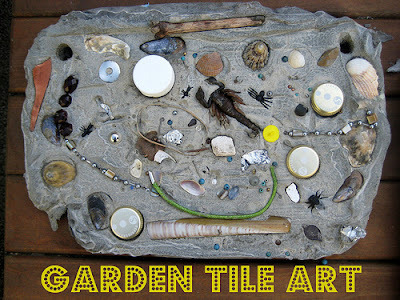 So here is my recommendation – visit Nurturestore and make a cement garden tile. Leave mini muffin pans for mini muffins. And pop over to The Golden Gleam to see if she fared better with cement. Love this post :). 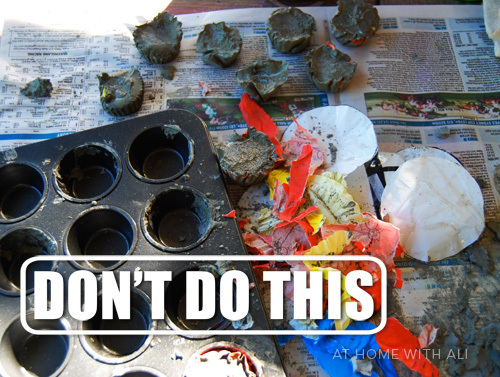 Your idea was good, but maybe you should try making mud bricks instead of cement ones! I was excited about cement too, but got discouraged by the hubs before even starting the project :). Thank you, mud bricks is an excellent idea. Those muffin tins won't be seeing any muffins!!! I kinda like the uncolored ones. I would have thrown them in the garden and called them " mini sculptures". That's a good idea. Thanks for visiting Melissa.